Use these old fashioned soda fountain recipes from the late 1800s to make your own refreshing carbonated sodas and soft drinks. It's easy! I'll show you how. 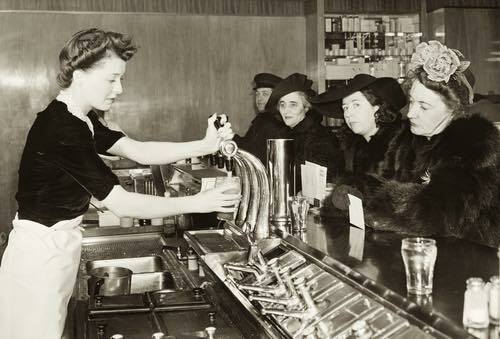 Treat yourself to a homemade soft drink and experience the authentic taste of yesteryear. 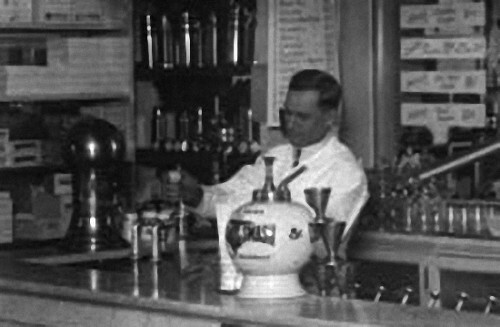 The pharmacy soda fountain operators made sodas by adding measured amounts of flavoring syrups to chilled soda water. The flavored fountain syrups would be freshly prepared by the pharmacist's assistant each morning using the soda fountain recipes found below. To make a soda, just add two to four tablespoonfuls of the fountain syrup to a tall glass of chilled soda water to taste, and you will enjoy an old time treat. Fountain drinks were traditionally served in a tall, fluted, frosty glass with a straw. This is one of the easiest ways to make your own soda pop. Plain, carbonated soda water or tonic water is available for sale in the beverage section at most food and convenience stores. When a customer ordered a "cream soda" the pharmacist simply added a tablespoonful of sweet cream to the flavored soda water. Unwhipped whipping cream will do perfectly. It makes a creamy smooth, rich-tasting beverage. To make a frosty "ice cream soda," he placed a big scoop of vanilla ice cream on top of the glass of syrup flavored soda water, and served it with a long-handled spoon and a straw. Top with a maraschino cherry. So delicious! You can also use these old time fountain syrups with your favorite homemade ice cream as tasty ice cream sundae toppings or to flavor milk shakes. Simple Syrup is used as a base ingredient in many soda fountain recipes including those featured below. Simple syrup and nice golden syrup, equal quantities of each, and mix well; then use a few drops of oils of wintergreen and sassafras to each bottle, as used. This mixture of golden syrup in this sarsaparilla recipe makes the sarsaparilla a beautiful dark color without other coloring. The amounts for the desired flavors cannot be given exactly to suit everyone, but all will wish different flavors, in some towns using very high flavor, and in others sufficient to perceive it, merely. All will soon get a plan of their own, and like it better than that of others. You'll need to experiment. The juice of any acid fruit can be made into syrups by using 1 pound white sugar to 1 pint of juice, and adding some peel; boil 10 minutes, strain, and cork. An excellent cream syrup is made as follows: Fresh cream, 1 pint; fresh milk, 1 pint; powdered sugar, 1 pound; mix by shaking and keep in a cool place. The addition of a few grains of bicarbonate of soda will retard souring. Strawberry juice, 1 pint; simple syrup, 3 pints; solution of citric acid, 2 drams (1-1/2 teaspoons). Take of the juice of lemons one pint, white sugar one and a half pounds, and a little of the peel. Mix and boil a few minutes, strain, and when a little cool, bottle, and cork, for use. Sherry wine, 1 pint; simple syrup, 1 pint; 1 lemon cut in thin slices; macerate [let sit] 12 hours, and strain. Fluid extract of vanilla, 1 ounce; simple syrup, 3 pints; cream or condensed milk, 1 pint; color with carmine [red food coloring]. Put 6 ounces of pulverized sweet almonds and 2 ounces of bruised bitter almonds into a saucepan with 1 quart of water, and let them simmer for a quarter of an hour; then add 1 pound of sugar. When dissolved, strain through a fine sieve or jelly bag, and add a teaspoonful of orange flower water. When cold, a wineglassful of the mixture should be put into a tumbler, which should be filled up with soda or seltzer water. Equal parts of maple syrup, honey, and raspberry juice. Serve solid in 8-ounce glass, using 2 ounces of above syrup for the flavor, and fill glass with carbonated water.